| Alexa.com New Zealand traffic rank * Alexa.com international traffic rank : average daily unique visitors ( link to blog's own publicly viewable traffic meter, or "verified" if editor has been emailed private stat counter image, or link to self-reported metrics if credible ) all other traffic stats are also "(est.-no stats)"
Just letting you know my party affiliation is no longer progressive. Hi really interested in your blog ranking system but was wondering how you select the blogs to be ranked? I do understand its just politics and news type ones but how do you find them? artandmylife: Apart from people nominating blogs on this site it comes down to constant monitoring of the blogs at the top end of the list - if unlisted blogs are mentioned or linked to in their blog rolls then they will be added. 1. How do you calculate the average daily visits from Alexa? 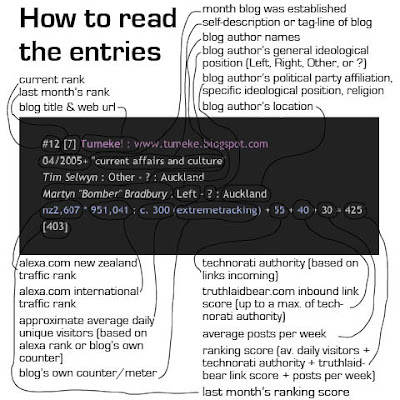 1. see FAQ: how do we calculate blog traffic? in the sidebar. 2. Yes - if no other information available.